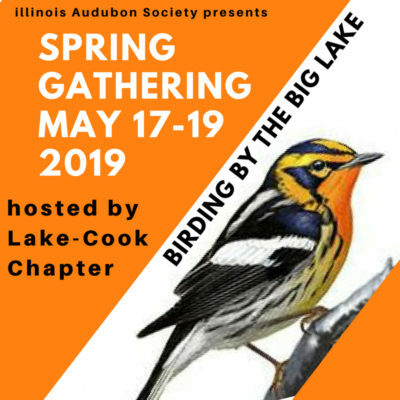 Join your hosts from the Lake-Cook Chapter for three days of great birding, food and programs. A raffle and silent auction will be held featuring many great items to win or purchase. The full schedule can be found here. LET THE FUN BEGIN !! Basic registration is just $15. Members and non-members are invited to attend. Reserve your room at the DoubleTree Hilton (click here). Spring Gathering deadline for registration is April 28. 2019. Look over the entire weekend schedule (click here). Look over the list of exciting auction items – check back as we add more (click here). Watch your email for information and updates. Please contact us if you are having problems registering online. Field trips are scheduled for Saturday morning, afternoon and Sunday morning. Morning field trips (AM) will begin at approximately 6:00 a.m, afternoon field trips (PM) will begin at approximately 1:00 p.m. Exact times will be listed in your registration packet along with an address for each location. All field trips have a maximum capacity. Once a field trip reaches capacity it will be closed. All walking is on easy flat trails. Sand dunes/beach habitat may be more challenging. Bulk water will be provided on all trips – please bring a refillable water bottle. Your lunch will be transported for you to your selected Saturday AM location. Sunday lunch will be at Half Day Forest Preserve, Shelter A. Please consider relative distance between Saturday AM and Saturday PM locations. Longest drive time is 90 minutes between North Point Marina/Illinois Beach State Park North and Crabtree Nature Center or Paul Douglas Forest Preserve. Please plan accordingly. Below is a complete list of all field trips offered; however, as trips fill up they will not appear as options on the registration form. Montrose Point & Jarvis Sanctuaries (Saturday all day) – Multi-stop trip along Chicago’s lakefront begins at Montrose Beach/Magic Hedge, with habitats attracting passerines, shorebirds, terns and gulls. There is an additional $15 charge for this field trip which includes van transportation. Maximum 30. Rollins Savanna (Saturday AM, Saturday PM, Sunday AM) – This 1,200+-acre preserve offers Lake County’s best grassland birding as well as prairie, marsh and pond birds, potential shorebird habitat, and an open oak savanna for warblers and other passerines. Target birds include Henslow’s Sparrows and Bobolinks. Maximum 20. Daniel Wright Woods/Half Day Forest Preserve (Saturday AM, Saturday PM, Sunday AM) – Linked together by a footbridge over the Des Plaines River, these twin preserves are popular hotspots for migrating warblers, vireos, flycatchers and thrushes. Maximum 20. Illinois Beach State Park South Unit (Saturday AM, Saturday PM, Sunday AM) – Diverse habitats including oak woodlands, dune/swale trails and the Lake Michigan shoreline offer a wide variety of species from warblers and shorebirds to Sandhill Cranes. Maximum 20. Openlands Lakeshore Preserve (Saturday AM, Sunday AM) – One of the last remaining ravine and bluff ecosystems in Chicagoland, this restored 77-acre preserve along Lake Michigan hosts warblers, sparrows and other migrants as well as nature-oriented art installations along paved ravine roads and in the open woodland/ prairie/savanna. Maximum 20. Chain o’ Lakes State Park (Saturday AM, Sunday AM) – This large park’s rich mix of prairie, bog, upland forest, lakes and streams can hold everything from warblers and waterfowl to Bobolinks, Northern Harriers and breeding Osprey. Maximum 20. Dam #1 Woods-East (Saturday AM, Sunday AM) – Easiest walking trip of the weekend combines woodland and river habitat for leisurely looks at land and water birds along the Des Plaines River Trail. Maximum 20. Waukegan Beach/Harbor/Pines (Saturday PM, Sunday AM) – Beach, dune and harbor habitat on Lake Michigan can yield shorebirds, gulls, terns, waterfowl and sparrows, with a section of trees on the same property attracting warblers and other land migrants. Maximum 20. Ryerson Conservation Area (Saturday AM, Saturday PM) – Located along the Des Plaines River corridor, this preserve is an inland migrant magnet that includes a woodland trail abutting the river as well as forest and meadow habitats. It’s historically one of the best spots for warblers in Lake County with near-yearly appearances by Connecticut Warbler and an occasional local rarity such as Western Kingbird and White-eyed Vireo. Illinois Beach State Park North Unit / South Trail (Saturday AM) – Accessed from the fisherman’s parking lot at North Point Marina, the IBSP North Unit South Trail is a haven for migrating passerines with woodland, shrubland, marsh and grassland areas. Beach viewing also offers opportunities for waterfowl. Maximum 20. Crabtree Nature Center (Saturday PM) – With bird feeders, an exhibit building, a blind to view waterfowl, and trails winding through woodland, wetland and prairie, this site serves up species from songbirds, sparrows and shorebirds to Black-crowned Night Herons and an occasional Summer Tanager. Maximum 20. Skokie Lagoons/Erickson Woods (Saturday PM) – Offering open water as well as marsh, woodland and meadow, this location provides relatively easy warblering, sparrowing and waterfowling along with the occasional hoot of a Great-horned Owl. Maximum 20. Paul Douglas Forest Preserve (Saturday PM) – With grassland, wetland and oak savanna as well as a heron rookery, this Cook County forest preserve can host specialties including Yellow-headed Blackbird, Henslow’s Sparrow, Bobolink and Least Bittern plus songbirds and waterfowl. Maximum 20. The Grove (Sunday AM) – A National Historic Landmark that includes a small interpretive center, this Glenview Park District gem has trails that wind through oak-hickory savanna and a series of wetlands to create a local migration hotspot. Maximum 20.